The Heswall Society has been the Advisory Committee to the Council on the two Conservation Areas since they were designated in 1979. Both Conservation Areas contain Listed Buildings. Heswall Lower Village Conservation Area. The original small fishing and farming village lies at the heart of the Conservation Area. It retains much of the character of a typical English Village, with its church, rectory, public house, village hall, shops and groups of cottage scale dwellings and former farm buildings. The surrounding parts of the Conservation Area comprises two distinct elements. There is the area characterised by substantial houses set in large grounds towards and along Dawstone Road and the more clustered, modest scale development based around Dee View Road, Feather Lane, The Mount, and the upper part of School Hill. The special character of Dawstone Park at the junction of these three distinct areas is also protected. 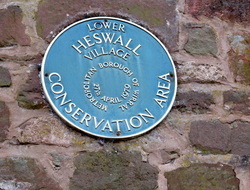 Further information on the Conservation area including a map of its boundary and descriptions of its buildings can be accessed by clicking on Heswall Conservation Area. Gayton Conservation Area lies about 750 metres south east of Heswall Lower Village. The original settlement is of medieval origin and can be traced back to the Domesday Book; the oldest remaining buildings relate to the seventeenth century. The heart of the village has an intimate scale and retains a remarkable degree of its rural character. The cobble stoned Gayton Farm Road leads towards the Hall and behind Gayton Farm Road is a web of narrow routes and enclosed spaces. There are spectacular views of the Dee Estuary and North Wales from several places in the village. Further information on the Conservation Area including a map of its boundary and descriptions of its buildings can be accessed by clicking on Gayton Conservation Area. Caring for the Conservation Areas: Care is needed to properly preserve the buildings, walls and general character of the Conservation Areas. The sandstone walls of the Gayton and Heswall areas are especially at risk of harm if pointed in the wrong materials. The Council publishes a Conservation Area Guidance Leaflet which is available via this link: Conservation Leaflet.